For other uses, see Pictou (disambiguation). "As constant as the northern star"
Pictou (Pick-TOE, Scottish Gaelic: Baile Phiogto) is a town in Pictou County, in the Canadian province of Nova Scotia. Located on the north shore of Pictou Harbour, the town is approximately 10 km (6 miles) north of the larger town of New Glasgow. Once an active shipping port and the shire town of the county, today Pictou is primarily a local service centre for surrounding rural communities and being the primary tourist destination in this region of Nova Scotia. The name Pictou, pronounced 'Pictoe', derives from the Mi'kmaq name Piktuk, meaning "explosive place", a reference to the river of pitch that was found in the area, or perhaps from methane bubbling up from coal seams below the harbour. Pictou had been the location of an annual Mi'kmaq summer coastal community prior to European settlement. Pictou was part of the Epekwitk aq Piktuk Mi'kmaq District, which included present-day Prince Edward Island and Pictou. Pictou was a receiving point for many Scottish immigrants moving to a new home in northern Nova Scotia and Cape Breton Island following the Highland Clearances of the late 18th and early 19th centuries. While there were a significant number of Scottish people settled in other parts of Nova Scotia at the time Pictou was settled, the town's tourism slogan is "The Birthplace of New Scotland", which is based on being the first primarily made up Scottish immigrants. The first wave of immigrants arrived on September 15, 1773, on the Hector. When the Hector arrived, there were already a few families in Pictou that had arrived on the Betsy six years earlier.The town has an indirect connection to Scottish settlement in New Zealand; the Reverend Norman McLeod emigrated to Pictou from Scotland some years after the Hector but eventually re-settled with his parishioners at St. Ann's on Cape Breton Island. He later encouraged his parishioners to move to Waipu where there are still many descendants from Pictou and St. Ann's. ICR cars at dockside in Pictou, ca 1912. In 1812 Sir Hector Maclean (the 7th Baronet of Morvern and 23rd Chief of the Clan Maclean) emigrated to Pictou from Glensanda and Kingairloch in Scotland with almost the entire population of 500. Sir Hector is buried in the cemetery at Pictou. During the latter part of the 19th century, Pictou's industrial sector gained strength. The Intercolonial Railway was built to the town on a spur from the Stellarton-Oxford Junction "Short Line". Shipbuilding increased through the 19th century, particularly with the increase in coal being shipped from Pictou Landing, Abercrombie and the East River of Pictou. A number of shipyards have been continuously established in the town since this period. A notable shipbuilding accomplishment was the speedy construction of 24 Park ship freighters by the newly created Pictou Shipyard in World War II. After the war the shipyard continued operation building many fishing trawlers and ferries. The port's cargo activity increased after the nearby Scott Maritimes pulp mill opened in Abercrombie in 1965. CN Rail abandoned its service to the town in the late 1980s but other transportation - including Highway 106 (the Trans-Canada Highway) - opened in the 1970s to provide alternatives. In the 2016 Census of Population conducted by Statistics Canada, the Town of Pictou recorded a population of 3,186 living in 1,460 of its 1,627 total private dwellings, a change of −7.3% from its 2011 population of 3,437. With a land area of 8.01 km2 (3.09 sq mi), it had a population density of 397.753397.8/km2 (1,030.1751,030.2/sq mi) in 2016. Pictou Academy is the town's high school and was founded in 1803 by Dr. Thomas McCulloch, who was travelling to his new clergy posting on Prince Edward Island. He was convinced to stay the winter and ended up remaining in Pictou for much longer. Disappointed by the lack of education among Pictonians, Dr. McCulloch decided to start a "college". There was considerable argument between Dr. Thomas McCulloch and Nova Scotia's provincial government for funding however it finally became a reality in 1816 when the Pictou Academy was incorporated. The province of Nova Scotia would not let it be named a "college," as such, but it was a school of higher education (senior matriculation) which was open to people of every race and denomination. Between 1816 and the present, Pictou Academy has been in four separate buildings. The school was moved from its original building to a new site, while the second and third buildings both burned down. There were Academy graduates from every year since it was incorporated, excluding the years between several of its different buildings. At the start of the school year of 2003–2004, all high schools in Pictou County were closed, and their students began to go to the two new "superschools", Northumberland Regional High School, and North Nova Education Centre, for their education. The only exception to this is Pictou Academy, which continues to operate. The town operates a small library and [email protected] site. 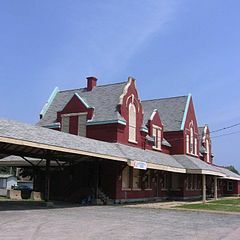 The former train station in Pictou is now a museum. 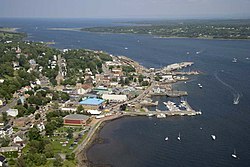 The primary tourist attraction in Pictou is the waterfront along Pictou Harbour. During the 1990s-2000s, industrial land on the Pictou waterfront was redeveloped with the centrepiece being construction of the replica tall ship Hector. Now completed, the ship is docked each summer at the Hector Heritage Quay, an interpretive centre that includes three floors of exhibits, as well as access to the floating replica. Next door to the Hector Heritage Quay is the Northumberland Fisheries Museum, Lobster Hatchery, and Lighthouse Museum. The Hector Festival, celebrating the arrival of settlers to Nova Scotia on the Hector takes place in August. In July, the Lobster Carnival takes place, and an amusement park is set up. The Lobster Carnival is a yearly event celebrating the end of the fishing season and has been a town festival since 1934. The waterfront redevelopment also features a marina and small boardwalk that connects to the Trans-Canada Trail. The historic Intercolonial Railway station on the waterfront has been restored. Grohmann Knives Ltd, the only knife manufacturing factory in Canada, are the sole producers of the historic D.H. Russell Belt Knives and Grohmann Kitchen Knives for over 50 years. Free factory tours of the plant are offered to the public. The war cenotaph was sculpted by the renowned George Hill. Water taxis and boat tours of the harbour are available, which also connect to the town of New Glasgow. Pictou is 5 kilometres south of the port of Caribou where Northumberland Ferries Limited operates a seasonal vehicle-pedestrian ferry service to Prince Edward Island; there is also a pedestrian-only ferry that operates seasonally to Pictou Island. Several beaches are located near the town of Pictou, most notably Caribou Provincial Park and Waterside Beach Provincial Park. Sir William Dawson, born in Pictou in 1820. He resided in Pictou until 1840, when he travelled to Scotland to complete his education in geology and natural history at the University of Edinburgh. He returned to Nova Scotia in 1842 and served as superintendent of education from 1850 to 1853. In 1855, he moved to Montreal, Quebec, to become the principal of McGill University, a position he held with distinction until 1893. Peter Crerar, civil engineer, came to Pictou from Scotland in 1817. Designed and built the Albion Mines Railway, the first standard gauge railroad in North America. Carmen MacDonald, an ice hockey goaltender for the St. Lawrence Saints, a university team from New York State. She won a gold medal as part of Canada's National Women's Under-18 Team at the 2010 IIHF World Women’s Under-18 Championship in Chicago. Three naval vessels have been named for Pictou, two Royal Navy schooners during the War of 1812 (see: HMS Pictou), and HMCS Pictou, a Flower-class corvette that served in the Atlantic during World War II. ^ Putnam, Donald F. (1976). "Pictou". In William D. Halsey (ed.). Collier's Encyclopedia. 19. New York: Macmillan Educational Corporation. p. 37. ^ a b c "Population and dwelling counts, for Canada, provinces and territories, and census subdivisions (municipalities), 2016 and 2011 censuses – 100% data (Nova Scotia)". Statistics Canada. February 8, 2017. Retrieved February 12, 2017. ^ "Gaelic Placenames in Nova Scotia | Open Data | Nova Scotia". Socrata. Retrieved 2018-04-06. ^ Rand, Silas Tertius (1875-01-01). A First Reading Book in the Micmac Language: Comprising the Micmac Numerals, and the Names of the Different Kinds of Beasts, Birds, Fishes, Trees, &c. of the Maritime Provinces of Canada. Also, Some of the Indian Names of Places, and Many Familiar Words and Phrases, Translated Literally Into English. Nova Scotia Printing Company. ^ "Micmac Locations". Micmac Tribe. Access Genealogy. Retrieved 27 May 2014. ^ a b A History of the Clan Maclean from its first settlement at Duard Castle, in the Isle of Mull, to the present period including a genealogical account of some of the principal Families together with their Heraldry, Legends, Superstitions etc". by J. P. MacLean, 1889, p. 263. ^ "I:\ecstats\Agency\BRIAN\census2" (PDF). Archived from the original (PDF) on 2013-10-05. Retrieved 2012-12-26. Wikivoyage has a travel guide for Pictou. Wikisource has the text of the 1911 Encyclopædia Britannica article Pictou.